Hi friends! Today I have the Galentine’s Day card I made for my best crafty friend. I was super lame and got it in the mail late, so she only received it yesterday! But any day is still a good day to get a handmade card in the mail, right? Right. 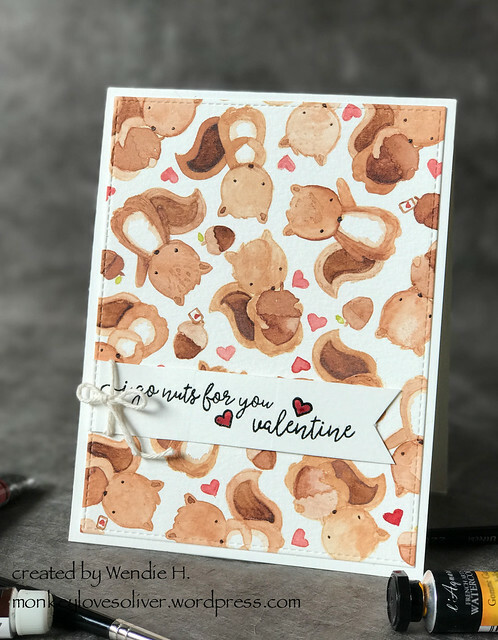 To make this card, I used the individual squirrel stamps from Neat and Tangled’s My Favorite Nut stamp set. I stamped the squirrels randomly around a piece of watercolor paper using Distress Ink in Antique Linen, so I could do no-line watercoloring. I used various tubes of watercolor paint mostly from Holbein. I’m not entirely pleased with my painting. So much brown and I didn’t have enough patience to really get my squirrel details down. Oh well. I still think it turned out pretty cute. While the squirrels were drying, I trimmed a piece of scrap watercolor paper into a flag and stamped the sentiment on it. I used a stitched rectangle die to further trim the main watercolor panel and then adhered the panel to an A2 top-folding card base. 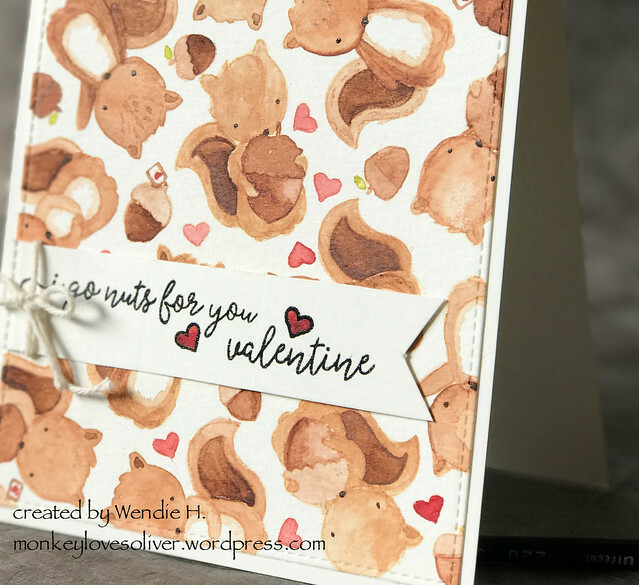 I think this is a card that my cat Oliver would give his little squirrel friend that visits him from time to time at my craft room window. He comes up to the window and chatters at Oliver and drives the poor cat bonkers. Ollie bangs on the window with his little paw, and the squirrel jumps into a nearby tree and just chatters away at him. It’s super cute.